Oppo sub-brand Realme will be first brand to launch MediaTek Helio P70-powered smartphones globally. This was confirmed by Realme CEO Madhav Sheth. The MediaTek Helio P70 octa-core SoC is being built on TSMC's 12nm FinFET process and is designed for enhanced AI functionality. Additionally, Sheth also confirmed on Twitter that upcoming Realme phones will also feature Oppo's Super VOOC fast charging technology. Realme is Oppo's sub-brand that is currently exclusive to India but it looks like the company would be aiming for a global presence soon. 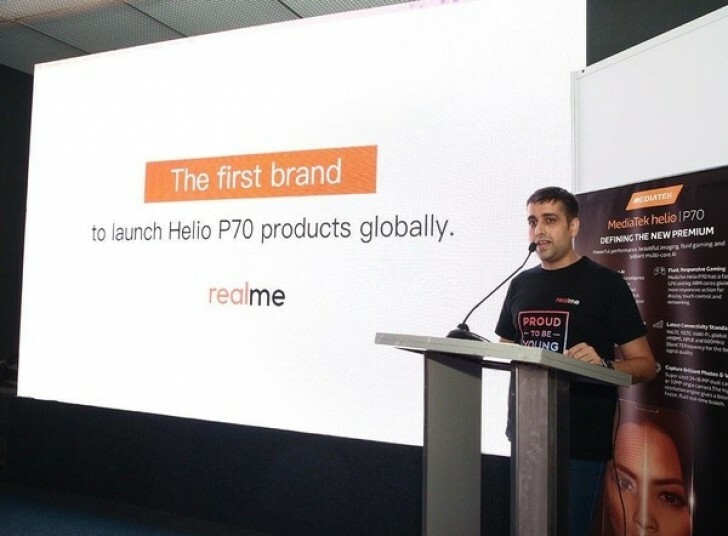 Not just that, Realme will also be the first brand in the world to debut devices based on MediaTek's latest mid-range SoC, the Helio P70. This was revealed by Realme CEO Madhav Sheth yesterday. News about the Helio P70 has been doing the rounds for quite some time now with Ulefone even announcing plans for the T2 Pro powered by MediaTek's latest premium offering way back during MWC 2018. But we haven't heard from Ulefone since. MediaTek made the Helio P70 official just a few weeks ago and looks like Realme will be the first to lap it up. The 12nm Helio P70 is one of MediaTek's most powerful offerings till date. Featuring four ARM Cortex-A73s at 2.1 GHz and four ARM Cortex-A53s at 2 GHz in a big.LITTLE configuration along with the Mali G-72 MP3 GPU at 900 MHz, the Helio P70 has been shown to best the average Qualcomm Snapdragon 821 and HiSilicon Kirin 960 SoCs making it a great option for upper mid-range handsets. The Helio P70 is also expected to sport new AI enhancements in the form of NeuroPilot that promise anywhere between 10-30% improvements over the Helio P60 in AI tasks such as real-time face and scene recognition. Oppo phones have traditionally featured Super VOOC fast charging tech and it looks like upcoming Realme phones will be getting it as well. This was confirmed by Sheth to a user's query on Twitter. Realme looks to follow in the footsteps of contemporary Chinese brands for a global presence. Xiaomi recently launched the Poco F1 in more than 40 markets worldwide while the OnePlus 6T has even managed to garner US carrier approval. It looks to be seen what plans Realme has but if the success of the Realme 2 Pro is any indication, this Oppo sub-brand has the potential to create its own space in the market.